Mooredge, Simonstone Road, Sabden, Clitheroe, BB7 9HA. 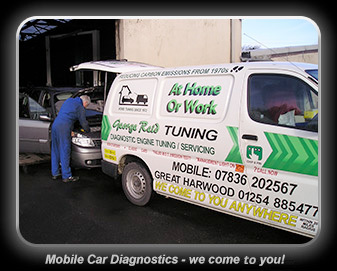 Welcome to George Reid Mobile Car Diagnostics and Mobile Engine Tuning. George Reid has been optimising car engines for 40 years and has a great deal of experience in all car engine tuning problems. Not only do we diagnose but we fix any issues that can be fixed. We use state of the art Snap-on computer systems to help identify any issues. As we are mobile, we come to you and there is no need to take time off work. If the car is a non-starter we come to you wherever you are. We cover Accrington, Bacup, Blackburn, Bolton, Burnley, Clitheroe, Colne, Edenfield, Great Harwood, Haslingden, Nelson, Preston, Rawtenstall, Ribble Valley and Rossendale. In fact we cover most of Lancashire and other areas by appointment. If your engine warning light comes on then call us and we can come to visit whether it be at home or work. We will source the problem using current technology and then fix it using our years of experience in cars and engines. As soon as the light comes on you need to get it looked at, the longer you leave it the more damage you could be doing to your car. This means it could cost you more to fix it when you do get it looked at. CALL NOW! There is no need to pay expensive car dealer prices - call your friendly local Mobile Car Diagnostic George Reid. If you have any engine issues with your car, or are looking to have it reconfigured to factory settings and optimised for performance, then call me George Reid and I will come to you at home or work and get your car fixed. For those of you with classic cars, George Reid Mobile Engine Tuning is the place to call to get your pride and joy checked over. We have a great deal of experience in cars of all ages and types. Have a low cost car diagnostic check run on your classic car and keep it perfect on the inside as well as the outside.